Dublin-based Crane Hire Ltd has expanded its fleet of cranes, says the company’s Managing Director Jarlath O’Leary. “The main news here is that we bought another Liebherr, this time a 300-tonne LTM1300-6.2 for €1.5M,” he explains. 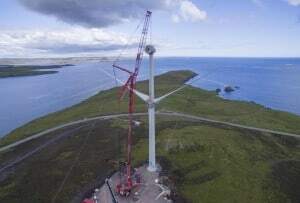 “The crane has a 78-metre telescopic boom and a 35 meter swing section, which can be offset to 40 degrees. Its unique feature is its ability to set up with its outriggers at varied lengths, the computer then recognises this and redefines the SWL depending upon the position of the boom and configuration. It also allows increased capacity throughout the load chart and especially with the boom extended directly over an outrigger.